The Ideologue is burdened with responsibility and synchronization. Bucky is adhering to his core principles of an organic and inherent way of doing things. He uses signifying phrases such as “continuous tension”, “whole thinking” and “line of sight.” The Ideologue archetype counts for about 27% of the cultural landscape of Everything I Know. The Alchemist craves experimentation and the experience of implementation. This is quintessential Bucky, where we see Bucky hands on, where his magic happens. The signifying phrase “design science” appears multiple times. “Energetic geometry” comes into play, as does “revolution.” The Alchemist archetype counts for 36% of the cultural landscape of Everything I Know. The Realist is driven by codes of viability and scalability. This is the reality check aspect that tempers the others. It includes signifiers such as “tools” and “powerful people.” In the case of Buckminster Fuller, it does not overtake archetypes more critical to his core. The Realist archetype is limited to 16% of the cultural landscape of Everything I Know. This is curious because viability and scalability are common buzzwords in the professional world, yet if introduced too early they short sheet innovation. The Strategist archetype is driven by the codes of gravitas and integrity. Bucky wants his efforts to be meaningful to the world. This archetype allows for future planning and future proofing. This is where signifiers appear, such as “logical things,” “paying attention” and “pattern integrity.” The Strategist accounts for 21% of the cultural landscape of Everything I Know. Through linguistic analysis, Buckminster Fuller’s signifiers are identified throughout Everything I Know. Each signifier is then plotted by session on the matrix revealing the cultural patterns within. To best experience the data, go directly to the visualization by clicking the button above. Using Culture Mapping to analyze the transcripts of Buckminster Fuller’s Everything I Know, a 42-hour thinking-out-loud lecture series videotaped in 1975. If you don’t yet know about the life of engineering icon Buckminster Fuller, there is no more appropriate time than now to learn. Born in Milton, Massachusetts, 1895, Fuller (or as many know him, Bucky) is the preeminent voice on design innovation and systems thinking. In the late 1940s, he popularized the use of the geodesic dome as a building structure. His process of design was an organic one -- more akin to quartering music than to a eureka moment. A former Navy man, he was very in tune with navigation and the seas, and is frequently cited for the concept of trim tabbing. (The trim tab on a boat is a miniature rudder -- moving it a little can move the whole ship.) He was on a constant search for meaning, and believed his life’s work should be the property of all humanity. In 1969, the American Humanist Association Association name him Humanist of the Year. During the last two weeks of January 1975, Bucky delivered a series of 12 lectures spanning 42 hours discussing, literally, everything he knows. The lectures were videotaped -- and recently transcribed by the Buckminster Fuller Institute. They detail the events that compelled him to understand the world, his major inventions, such as the 1927 Dymaxion house, and his pioneering outlook. Always with an eye toward the big picture, Bucky asks the audience in the second session of his 1975 series, “What is common to all human beings throughout all history? Problem, problem, problem solving. We are here for problem solving,” Our commonality of problem solving is a simple conclusion Fuller arrived at after years of thinking and observation. Yet, as evidenced through Everything I Know, problem solving itself is not so simple. Why? Because problem solving is about understanding humanity. Getting real problem solving right is truly innovation, and it calls for a process of inductive research. The main difference between inductive and deductive approaches to research is that while a deductive approach is about having a hypothesis and testing, an inductive approach is concerned with the generation of new ideas evolving from data. Typically, deductive approaches are used. When ideas fail at the testing level, they are put to rest. With inductive, the idea would evolve in line with its context -- trim tabbing, essentially. Across the Everything I Know series, Buckminster Fuller spells out his process of inductive research -- but the series lives in a format meant for an academic audience. In our time-depraved world where lack of immediacy can kill good ideas, we wanted to unlock what Bucky was saying for the rest of us. How could we make Bucky’s lifetime knowledge more easily and wide accessible, providing strategists from all disciplines with vital information for helping grasp Bucky’s intent. It’s one thing to emphasize a systems approach, but what does that mean -- who does one have to be and what is the plan they need to follow? To get to the bottom of the issue, we processed the Everything I Know transcripts using natural language processing to identify and score potential signifiers from Bucky’s words session by session. Based on the signifiers, his sessions walk us through framework, investigation, instrumentation, calibration, systematizing, trim tabbing, conspiring, orchestration, realization, investment, principles, vision. Then, we took these signifiers by session and plotted the most illustrative ones according to our semiotic matrix. 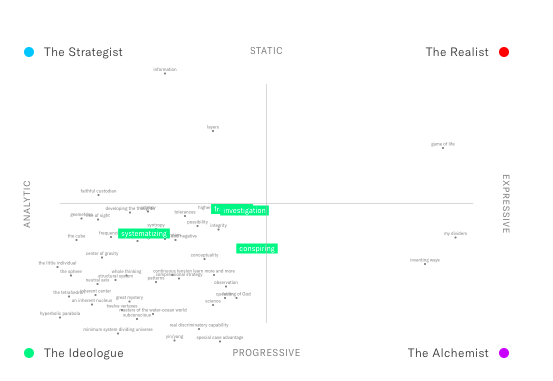 We use our patented matrix to see how clusters of language are playing out, leading to archetypes of ideology. It demonstrates a tangible visualization of Bucky’s cognitive framework and its evolving truths and tensions. In the case of Buckminster Fuller and the Everything I Know series, four distinct archetypes appear. The Ideologue, The Alchemist, The Realist and The Strategist. Each archetype is based on human codes rising from the signifiers in the text. The codes are guiding principles that the archetype seems to innately follow. From these archetypes, strong vision and technique emerge and so too does the critical nature of accepted zeitgeist. Each archetype lives within Bucky’s recollection of everything he knows. Over his lifetime, he is an amalgamation of the archetypes. The Alchemist, where he is his most comfortable -- the man experimenting with geodesic domes, factors most prominently. The Realist, where he discusses the reality of power structures and financing, the least. By seeing the archetypes, we can confer how Bucky sees things working in the world, beyond his own successes and trials. One begins with ideology, craves experimentation, receives a dose of reality, and constantly strategizes. At the end of the day, the real problem is people fear innovation by process because they don’t understand it or fear that it will be inhibitive, which is not true if done correctly. It seems at present we are not doing it right. For each issue of concern tied to Everything I Know, we also tracked patents where Buckminster Fuller was cited as an inspiration. Curiously, none of the patents applied for were granted. In 1975, Bucky told us all how to get innovation moving forward throughout Everything I Know. We made it seeable. We’ll close with this provocation from Bucky, “Apparently we have been given a very big cushion to make mistakes in, but I'm saying, that the cushion is coming to an end. The CUSHION is coming to an end…” Let’s start revisiting our research practices to make Bucky’s thinking more widespread while we still have time. Innovation should not be behind us.